All that remains of Robert FitzHarding's Church is the south door and the font. The position of these may well have been changed. The Norman features of the doorway are best seen from the outside. The font was built for the total immersion of infants. The core of the present building dates from 1225-1250. The main features dating from this period are the nave and the west front. The nave is one of the main architectural features of the Church.The Early English arcades to both south and north of the nave have 7 arches. The pillars have clustered shafts and foliated capitals (There is one capital of geometrical design). The West Front Exterior is another important feature of the building. The central window has five graduated round-headed lancets with moulded hoods and slender shafts. Below, there are three pointed moulded arches with steep gables rising from jamb shafts. There is a cusped and subcusped inner arch over the doorway - Bristol fashion. 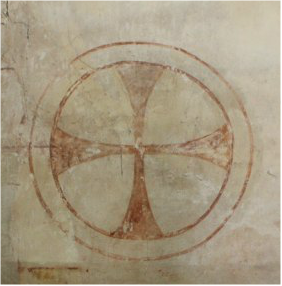 To the north of the door there is a painted 13th Century consecration cross and some intersecting arches. To the south of the door there are further arches of a different design. Above the windowsill there are the remains of two further crosses. Stairs give access to the north aisle and nave roof. From these stairs there is a door, which opens on to the sill of the west window. (At one time a gallery, which also housed the organ, was at this end of the church.) Further up there is a very unusual feature, another door opens on to a small platform with carved faces of a lady, a knight and a priest on the steps below. The function of this feature is unknown; there is a possibility that this formed part of a west end pulpit. The chancel arch dates from the same period as the nave. But there is a theory that it has been rebuilt, this is partly due to its present height. This was extended in about 1300. On the north side the window above the inner tomb recess (now used as a credence) is early 14th Century with three stepped lights. Of the two aisles this was the first to be built, or rather rebuilt, an indication of this is on the buttresses, which have no offset.1 There are heads, some of people and some of creatures, on the external springers of the windows. This aisle was rebuilt towards the end of 14th Century. The buttresses have offsets.1 The window springers are of a geometrical design. The north door dates from the 14th Century as does the lower half of the porch, which has an ogee, arched entrance. There is a large wooden bolt, which was used for securing the door. The lower part of the vestry dates from the 14th Century. The wall paintings are the feature of the church that make the building of national, if not international, importance. This was put forward by Peter Burman FSA in 1986, whom at the time was the Secretary of The Council for the Care of Churches. The basis of the decorative patterns date from 13th Century and 14th Century, the time when the nave and aisles were built. During a restoration of the church carried out in 1865/6 by Messrs Clayton and Bell under the supervision of Sir George Gilbert Scott, many layers of whitewash and plaster were removed from the walls. This revealed patterns that were traced and the interior of the church was then restored. James Cooke, writing soon after 1871 says: "They are exact reproductions of the original decorations of the 13th century, remains of which were found in all parts of the church when the repeated coats of whitewash and plaster were removed during the restoration in 1865. It is the opinion of competent judges that they form part of the original design of the building, many parts of which appear to have been left purposely bare of architectural ornament, in order that the want might be supplied in this manner. For this purpose they are most effective; the long straight lines of pattern fill up what would otherwise be blank spaces of wall, and enhance the perspective effect, while the richness and warmth of the colouring are most grateful to the eye after the cold whitewash to which the present generation has so long been accustomed. Some remains of a later and inferior style of mural decoration have been left on the wall over the north door. At the east end of the north aisle there are some fragments of an ancient painting of a martyrdom, near which on the splay of a window, was a beautiful figure of a saint or angel now almost faded away. Over the chancel arch appears part of what was probably a "Doom Picture", or representation of the last judgment. On the wall at the east end of the south aisle is a painting of the Tudor rose, surmounted by a crown, on each side of which are the letters E. R. A similar figure was found between each of the windows of the south aisle." Much of the decoration that we see today is Victorian; it is over painting of the original. There is little doubt that it reproduces what was there before. In a number of places the original decoration can be seen. The upper part of the porch was added about 1450 and contains the priest's room. Viewed from inside the church there is the remains of a window from the priest's room into the church. The room is now used as an office. This is a fine rood-screen (some of the stone work in the lower part has been changed). It is a huge piece of perpendicular tracery. The base of this 15th Century screen dates from 1300 when a screen was built to enclose a choir in the extended chancel. Built by Lord James, 11th Lord Berkeley (d.1463) and still owned by the Berkeley family. The roof was rebuilt c.1450. The original was probably high pitched, giving a high gable to the west front. There were probably steep lean-to roofs over the aisles. The Church formed part of the defences of the castle and was used as such during the Civil War. There are signs of the damage done on both the north and west doors. 1732 £240 paid "for new pewing ye Body of ye Church". 1733 £43 paid for "New pewing ye South ( ) of ye Church". In the south-west corner of the south aisle there are two lead sheets fixed to the wall (there is a third somewhere). These were removed from the nave-1914, the south aisle-1953 and north aisle 1954 when they were re-roofed. The tower was rebuilt in on a plinth that dates from the 15th Century. Demolition of the old tower had started by 1748. The new tower was built by Mr. Clark who, in 1753, was paid £740. A tower built onto the present Church would overlook the castle. In 1835 repairs to the roof cost £180. It was realised at this time that more work would probably have to be done. David Verey records that ‘Pope & Bindon’ did restoration work in 1862. From the Church Warden's account books that exist from about 1710 we know that a certain amount of whitewashing was done on an almost annual basis. There are also payments for replastering. The Church Wardens’ account books record that they were responsible for the collection and payment of £134 towards the work done on the roof of the church. We know from other near contemporary sources that the wall paintings were restored and that the church was also re-pewed. The total cost of the work was £5000, paid mainly by Lord Fitzhardinge. In 1889 £100 was spent on the restoration of the tower. The bells had just been recently re-hung.